Getting around Mexico using taxis is surprisingly affordable, especially when compared to taxi fares in places like the USA and Europe. This guide explains how taxis in Mexico operate, how much different types of cabs charge, and how to make use of taxis effectively and safely here. Getting about by taxi cab is relatively inexpensive in Mexico. Taxis are either metered, not metered; charged on a ‘per kilometer’ basis, charged by zones, or hired through an App-Taxi with services like Uber and Cabify. In comparison to taxi fares in the USA, Canada, and Europe, getting around by taxi in Mexico is relatively inexpensive, although it is considerably more expensive than using Mexico’s very affordable mass-transit systems including local buses, peseros (micro buses) and, where available, the Metro. In Mexico City, it’s best not to hail cabs off the street after dark, and if you are unfamiliar with the city and don’t speak Spanish, it’s always best to always use taxis from Taxi Ranks (Sitios) or from an App-Taxi service instead of hailing a cab from the street; see the section on this guide about taxis in Mexico City for more details about this. In other provincial cities and small towns in Mexico, taxi travel is generally regarded as safe and you can feel secure hailing cabs off the street at any time. Meters in cabs are verified/calibrated annually as part of the taxi’s license and you can be sure that, in most cases, the fare you see metered is the correct one for your journey. Cabs in many provincial cities do not have meters and there is no official zone charging system either. In these cases, agree the price you are willing to pay for your journey with cab driver beforehand. Historically, taxi driving has been a male-only domain in Mexico and the overwhelming number of taxi drivers in Mexico are still men. However, more recently increasing numbers of women taxi drivers have been seen chauffeuring cabs, especially in Mexico City. Taxi drivers in Mexico generally don’t speak English (a small few might speak a little English) so you will need to be able to speak some Spanish to get about independently by taxi cab in Mexico, or show the driver where you want to go on a paper or smartphone map. See the Taxi Travel Tips section at the end of this guide for advice about how to communicate with your cab driver if your Spanish is limited. Because of its size and complexity, and because of a spate of taxi-related crimes specific to Mexico City, traveling by taxi in Mexico’s capital requires some additional precautions. These precautions are exercised by most residents of the capital, and are not just relevant to foreign visitors. Taxi-related crimes in Mexico City flared up in a period around 2005-2007 causing the capital’s government to take a range of measures to deal with the issue. While taxi crime today is not as prevalent an issue as it was then, we recommend that you continue to exercise caution in the capital when hiring cabs. Technology has, to a large extent, mitigated many of the risks by enabling travelers to quickly and easily arrange licensed cabs in the capital by phone, or through smart-phone App. Taxi-related crimes are almost uniquely carried out in the capital and most often involve an ‘express kidnap’, whereby the passenger of a street cab (it’s rare that attacks take place with two or more passengers traveling) is held hostage for a time, and usually taken to an ATM, where the person is forced to withdraw cash. All personal belongings with any value are stolen, and the passenger is later ‘dropped-off’, usually in some nondescript neighborhood of the city. Mexico City’s authorities are acutely aware of the poor image taxi crime creates and implemented a range of measures to tackle taxi-related crime which had a dramatic effect in reducing taxi crime in the capital. At the beginning of 2008, the government re-licensed all of the capital’s cabs, issuing new-style plates, instigating new background checks on drivers, and issuing new forms of official ID. As a result of the programs, taxi crimes have diminished significantly, but they have not dissolved completely. As a result of these types of crimes—and also due to technology in the form of mobile telephones and smart-phone Apps—many people are by-passing street cabs in favor of Taxi Rank cabs (known as Sitio cabs) or using App-Cabs when traveling by taxi in Mexico City. Middle-class Mexicans—and women in particular— routinely phone cabs or arrange a Uber or Cabify taxi and don’t just hail one of the street. Partly as a result of the taxi crimes, many taxi drivers themselves have taken the initiative and joined taxi-cooperatives, taxi ranks (Sitios), or App-Cab firms, as the other face of taxi crime, far less reported, is that taxi drivers are sometimes attacked and robbed by uncouth ‘passengers’ they aboard from the street. Many residents in Mexico City now eschew street cabs altogether and opt instead for a taxi from a Taxi Rank, either by walking to the nearest rank or telephoning their local cab rank. Most capital dwellers have a couple of taxi firm or rank numbers stored in their phones to call a cab when they need one. There also exist a number of Radio Taxi firms, which cover the entire city (supposedly) and will send a cab to wherever you are—even on the street. Taxi Rank cabs are more expensive than street cabs but continue to be relatively inexpensive in comparison to cab fares in other capital cities such New York, Los Angeles, Paris, and London. Hotels either have a taxi rank outside the property with cabs that will charge on a meter, a fixed-fee depending on where you are going, or charge on a ‘rate per kilometer’ basis. Hotels without taxi ranks outside the property have the contact number of a taxi rank located nearby, and will telephone a cab for you if you need one. You need to know Mexico City and speak Spanish: Don’t take street cabs in Mexico City if you are unfamiliar with the capital and/or don’t speak much Spanish: if you are visiting the city, get your hotel to phone a cab, use a taxi rank cab (see notes above), or use your smartphone to arrange a service like Uber or Cabify. Flag down only properly licensed cab cars: From 2008, Mexico City’s government re-licensed all taxi cabs in the capital as part of a safety and quality campaign. All newly-licensed cabs have a distinctive white colored licence plate beginning with a capital letter and five numbers. Any street cab you flag down should show this new plate. Ensure your taxi driver is properly licensed: Be sure, whatever taxi you get into, that the driver’s license card is visible. The license card is a white, laminated document with official stamps, a hologram and a photograph of the taxi driver on it. The card should be presented as a full-color original and not be a photocopy. The number on the license card should match the license plates. If you are carrying any valuable equipment (e.g. laptop or expensive cameras) it’s best to get a cab from a taxi rank, use an App-Cab service, or get your hotel to phone a local taxi for you. Dress and act sensibly, following the general Safety Guidelines as set out on the Safety guide here on Mexperience. If you are not familiar with Mexico City and the place you are going, and/or if you don’t speak Spanish, it’s best to call to arrange a taxi via the hotel where you’re staying, phone a taxi rank (Sitio), or use your smart-phone to arrange an App-Cab service. They cost more than street cabs, but are still good value in comparison to a similar distance taxi fare in other major capital cities. Traveling by taxi in Mexico’s provincial cities (which includes Guadalajara and Monterrey) is generally regarded as safe, and the need to exercise precautions in relation to the taxi-crime that has pervaded Mexico City in recent years are not necessary. The big difference between traveling by taxi in Mexico City and Mexico’s provincial cities is that the cabs in the provinces are not as standardized and not all districts operate metered cabs, so it may be necessary to negotiate your price. Some cities operate a “zone” charging system, regulated by the local government, but in most places you visit across Mexico, what you pay in taxi fares will be what you negotiate. See ‘Types of Taxi’, below, for more details. Taxis operating in Mexico’s provinces will have different color schemes to Mexico City and even to other cities—there is no ‘national standard’ for cab colors or styles. You may end up traveling in a brand-new car or one which is very nearly worn out completely. Check the state of the tires of a cab before you board: tires in good condition are more likely to indicate a vehicle in good condition. Cab drivers in the provinces are even less likely to speak English, except perhaps in major tourist areas, so be sure you are armed with a few words in Spanish to help you get to your destination (also see ‘Tips for Taxi Travel in Mexico’, below). In major tourist cities, taxis will usually be charged by zone. Cab drivers are more likely to speak and/or understand some English. Taxis in the most popular beach resort towns including Cancun, Los Cabos, Puerto Vallarta, and Huatulco are relatively expensive in comparison to taxis in places like Mexico City, Acapulco, Manzanillo and Mazatlan and Mexico’s colonial cities. App Cabs like Uber and Cabify might be operating in the tourist city you are visiting, offering an alternative/competition to local taxis—Open your cab App and check to see if services are available in your current location. 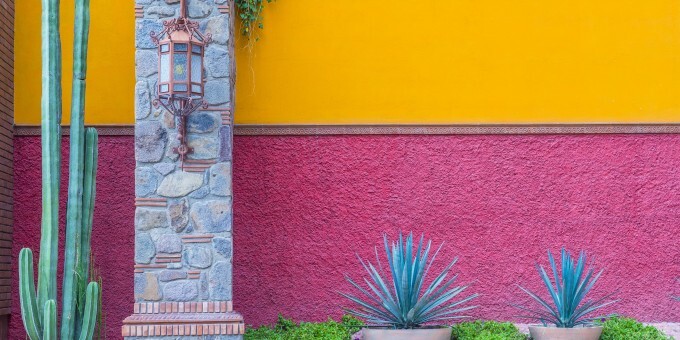 In Mexico City, these are painted in a distinctive pink and white. Outside of Mexico City, the paint color of taxis varies widely. Street cabs are the least expensive and, outside of Mexico City, they are generally regarded as safe to flag down. If you don’t speak some Spanish then you may find independent taxis a bit of a handful—some may try to overcharge you. Taxi Ranks are most common in Mexico City (marked “Sitio“), although you’ll find cab ranks in all towns and cities across Mexico. Many cab drivers, especially those working in the capital, are now affiliating themselves with local taxi co-operatives, or companies that service fares from a base or rank, and pick people up when they telephone to book a ride. There are many good taxi firms that will quote you a fare over the ‘phone for the journey you request, and tell you the details of the car type/plate that will pick you up. Most hotels are affiliated to a local taxi firm, and some even have a taxi rank outside, waiting for you to travel. Taxi services booked using a Smartphone app are available in Mexico. The principal service provider here is Uber, with Cabify also offering services in the capital. You get full details about App-Cabs in Mexico here on this guide. Taxis from Mexico’s airports are some of the most expensive you will pay for. There are always at least two taxi concessions given at each airport, but prices are still high in comparison to cabs hired from non-airport locations. Charges are applied by zone, depending on where you are going. 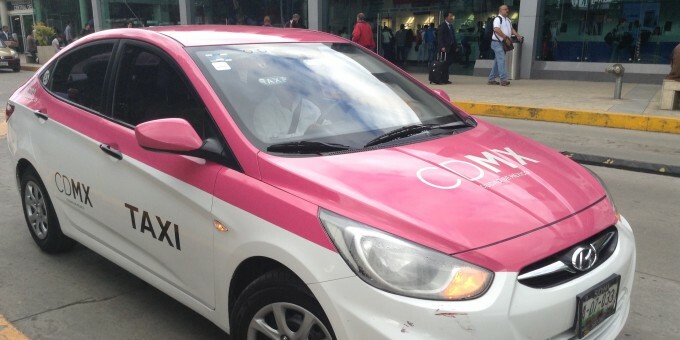 App-Cabs (like Uber and Cabify) now pick-up passengers from Mexico City airport; for other Mexican airports, check your App when you arrive and it should advise you whether airport pickup service is available there. Buses, and Mexico City’s Metro, are alternatives, but not realistic when you have lots of baggage and just want to get to your hotel, or back home. Some hotels have a taxi rank based outside the hotel, to board hotel guests at anytime. These may be charged at a fixed fee depending on where you are going (destinations and fares will be on display), or on a zone-based fare system, on a rate per kilometer and some may be metered. Larger or luxury hotels sometimes have a private fleet of cabs tied to the property. These taxis are relatively expensive in comparison to regular cabs but offer comfortable, air-conditioned, vehicles, usually with drivers who speak at least some English. Most operate fixed fares to specific destinations (e.g. to the airport) or charge on a price per kilometer basis. Check locally. All taxis in Mexico City are either metered or, for private taxis and taxis from the airport, a price per kilometer or a zoning charge is made. One kilometer (1,000 meters) is 1,093 yards, or about six-tenths of a mile. If you use Uber or Cabify in Mexico (see App Cab services) fares are based on these companies current rates, which fluctuate depending on local demand and supply. When you use these services, the App detects your current location, you enter the location you want to get to, and your App will present you with a fare which you can accept or refuse in the moment you intend to travel. If your cab gets stuck in traffic, if you ask for stop-over, or change your destination en-route then the fare will change to reflect the additional time accrued or distance traveled. If you take a cab from the Airport, buy an authorized taxi ticket from one of the booths in or near the terminal building – there are various companies vying for your business. Rates from airports are charged by zone and include the tip, although excessive luggage can be charged extra. (Two luggage bags per person is considered reasonable; if you are carrying more you may be asked to pay more.) From Mexico City’s Benito Juarez airport, to the center of the capital expect to pay about MX$350; for destinations to the far north, south or west of the city (the airport is in the east of the city) expect to pay up to MX$550. Taxi fares from airports have not reduced despite the fact that App-Cabs usually offer lower fares for an equivalent journey. Private taxis are usually based at hotels (some radio cabs are also private taxi firms) and charge a rate per kilometer. Radio cabs are authorized to charge about MX$50 to start (known as the banderazo)and then about MX$5 for each 250 meters (equivalent to $20 pesos per kilometer, 1/6th of a mile) or 45 seconds of time when the taxi is stationary. Taxi rank cabs (on a street rank or outside a hotel) charge on a meter, but at a higher rate than street cabs. Taxi Rank cabs charge an initial fare of around MX$25 and then around MX$4 for each 250 meters (equivalent to $16 pesos per kilometer, 1/6th of a mile) or 45 seconds of time when the taxi is stationary. If you get stuck in a traffic jam, this time-lapse charge is applied automatically by the meter. The lowest taxi fares (metered) are from the street cabs (see advice above about hailing cabs from the street in Mexico City) which begin the meter with a charge of about MX$12 and then around MX$2.5 for each 250 meters (equivalent to $10 pesos per kilometer, 1/6th of a mile) or 45 seconds of time when the taxi is stationary. If you get stuck in a traffic jam, this time-lapse charge is applied automatically by the meter. Some taxi rank cabs agree a fixed price from point A to B, which is often very reasonable and pitched between the Taxi Rank and street cab fares. For example, a fixed fare from Xochimilco (south edge of Mexico City) to the Airport (center east) costs around MXP$275 plus a tip (optional) when you book a taxi over the phone with a local firm/co-operative. These taxis offer some of the best deals in terms of security/price. You will need to be able to speak Spanish in order to book them. Zone charges will depend on rates set by the local state authorities or municipalities, but will correlate to the meter charges, plus a small percentage. Add 25%-50% to the prices quoted below for Meters when you are visiting highly popular tourist centers such as Cancun, Puerto Vallarta, Los Cabos, Ixtapa and Huatulco. Taxis from Airports, wherever you are in the country, are always more expensive. If you plan to do a lot of traveling within a local area, especially in popular beach resort areas where taxi fares are considerably higher than those in colonial towns and cities, you might consider renting a small car. Rates for car rental in Mexico are lower now than they have ever been. 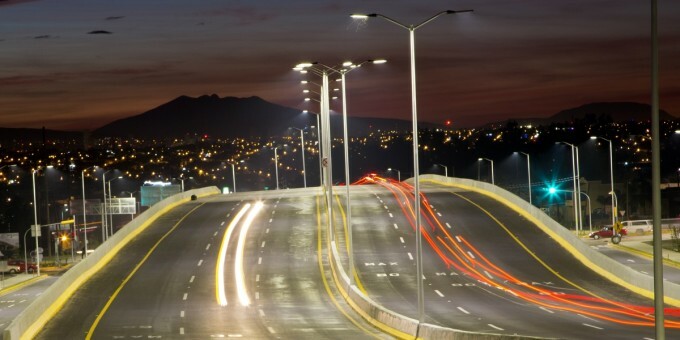 See Car Rental in Mexico for our guide about renting a car. 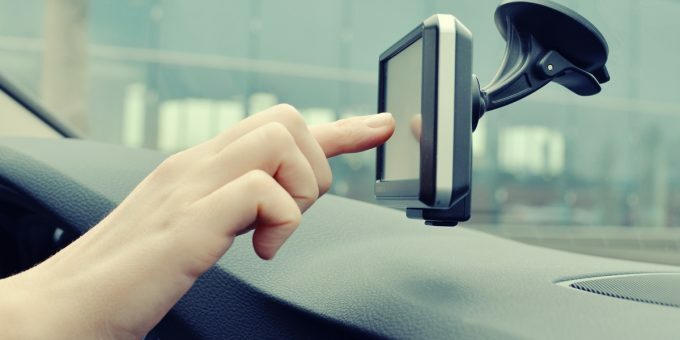 Smartphones are beginning to change the way that people book cabs in cities around the world. App-Cabs, offered through firms like Uber and Cabify offer customers the ability to book a cab using their smartphone, agree a price and time for pick-up. Uber is expanding rapidly across Mexico and now offers services in at least 14 cities across the country, including: Mexico City, Toluca, Cuernavaca, Puebla, Querétaro, León, Aguascalientes, San Luis Potosí, Guadalajara, Monterrey, Hermosillo, Tijuana, Mexicali, and Mérida. Uber has been adding Mexican cities to its network every year. Cabify is developing less quickly and currently operates in cities including Mexico City, Toluca, Monterrey, Puebla, Querétaro and Tijuana. The services offers people with smartphones a way to book a cab through a mobile app for a pre-agreed price. Fares are comparable with Sitio type cabs (see above), and sometimes trade at a premium to this when local demand increases. If you have a Uber or Cabify account in your home country, you are able to use the same App and account to hail cabs in Mexico. Charges are quoted and billed in Mexican pesos, and your credit card company will convert the charge into your local currency. e.g. US or Canadian dollars, British pounds, euros, etc. The Uber and Cabify services are particularly popular with young middle-class students, working professionals, and women. The service has gained a lot of popularity especially as the vehicles these services offer are newer that the average street cab, and with the App it’s possible to see where your vehicle is in relation to your current location and plan accordingly. There’s the added convenience of paying through your App-Cab account, so even if you don’t have much cash or are short of change, you can get a taxi ride. Note that App-Cab services require your smartphone’s data connection to work. If you are visiting Mexico and roaming with your non-Mexican smartphone data fees can be expensive. Check with your plan to see if you get an allowance for data roaming in Mexico. See the guide to Communications in Mexico for details about cell phone services here. Local language: Learn a few words and phrases in Spanish to help you communicate at least at a basic level with the driver. Besides getting to your destination quicker, building some rapport with the driver may get you a better fare in instances where the taxi is not metered. Have a map ready: If you know little or no Spanish, take a local map with you to show the driver; if you have a smartphone and a data plan that works in Mexico, you could use a mapping app like Google Maps or Apple Maps and use this to show the driver where you want to go, or use an App Cab service like Uber or Cabify as the GPS systems will guide to driver to your destination. Traffic congestion: In Mexico City, build-in plenty of extra time to your journey as traffic congestion can be severe in the capital, especially during the rush hours. If you are traveling to the airport or to a bus station to catch a scheduled transportation service, allow plenty of time for possible traffic congestion in the city. Find local Taxi Ranks: If you will be visiting Mexico for a while, or plan to live here, scout around for your nearest Taxi Ranks (Sitios), ask for their phone number and call them when you need a cab. You might also sign up for a Uber or Cabify if you have a smartphone and don’t use this service already. (Note that if you have a non-Mexican Uber or Cabify account you can use it to hail cabs in Mexico in the same way as you do back home and charges will be billed to you in your home currency.) Cabs will come right to your door or hotel, and will even meet you at a predetermined places like a restaurant or a landmark, and don’t charge extra for this. Have cash ready: Although some taxis are beginning to accept credit and debit cards, most don’t and those that do will usually add 10% to the fare to cover bank charges they pay to offer the card payment facility. Uber users pay through the app and there is no need for cash. We recommend you pay non-Uber/Cabify drivers with cash as they prefer it and it will save you money. Giving directions: In Mexico City, some street cab drivers won’t know the place where you want to go, so you will need to be able to direct them or, if you don’t speak Spanish, have a map on your person to show them where they need to go, or use a mapping application on your smartphone. This scenario is less likely with Taxi Rank cabs and never a problem with private or airport taxis as they carry street maps / apps in the vehicle. 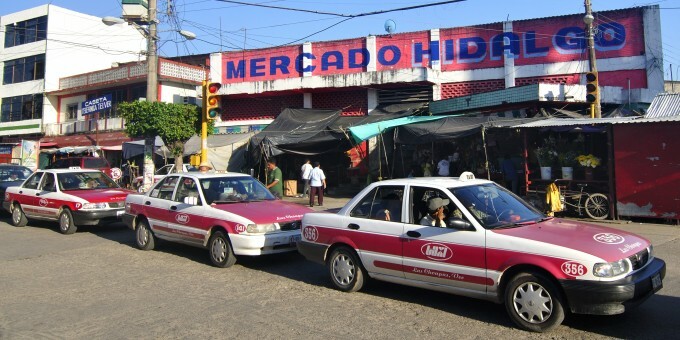 Taxi cabs in Mexico are plentiful, and provide an affordable means to get around towns and cities.